Since I’ll be leaving in a few days, my friends thought we should hit up some of my favorite restaurants and bars. Wednesday night, Robyn, Mike, Tash and I went to Koi, one of my favorite sushi restaurants. 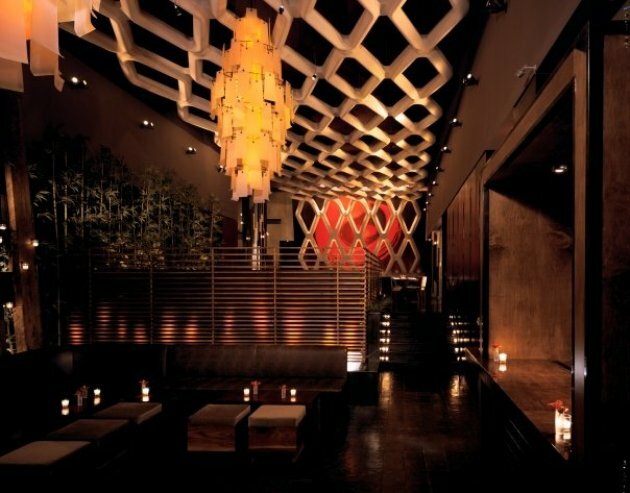 Located in the Bryant Park Hotel, Koi has some visually stunning decor. I love the giant lattice framework that extends from the back wall, and across the ceiling of the entire restaurant. I also love the chandeliers, which although large in size, have an airy quality because they’re made of a paper-like translucent material. The ambience is enhanced by the judicious use of candles, and the dark wood present throughout the dining room. All of which makes for an impressive backdrop for an equally impressive meal. To start, I had the “Pear”adise Martini, made up of Absolut Pear, Asian pear puree, and lime; the perfect balance of sweet and tart. Over drinks, Tash filled us in on her recent trip to Chile. Hearing about her adventures in South America made me excited about my own upcoming trip! We ordered several dishes to share. My pick, which I order every time, was the Koi Crispy Rice, topped with spicy tuna tartare. My favorite rolls were the Koi Dragon Roll (shrimp, eel, and crab) and the Baked Lobster Roll. It’s hard to go wrong in this place! If you find yourself in New York (or LA, Vegas, or Bangkok! ), treat yourself to dinner at Koi. It was packed, even on a random Wednesday night, so reservations are highly recommended.